Դաո Դե Ցզինը կամ Դաոդեջինգը դաոսական ամենաազդեցիկ տեքստն է համարում։ Լեգենդի համաձայն, այն գրվել է Լաո Ցզիի կողմից, և հաճախ այդ գիրքը պարզապես կոչվում է «Լաոցզի»։ Այնուամենայնիվ, հեղինակությունը, ծագման հստակ ամսաթիվը և նույնիսկ տեքստի միասնությունը դեռևս ենթակա են քննարկման և հավանաբար երբեք հայտնի չեն դառնա։ Դաո Դե Ցզիի ամենավաղ պեղված տեքստերը (գրված բամբուկե տախտակների վրա) վերագրվում են մ.թ.ա. 4-րդ դարի վերջերին ։ Կրոնական դաոսականության պատմության ընթացքում Դաո Ցզին օգտագործվում է որպես ծիսական տեքստ։  Դաո Դե Ցզիի հայտնի առաջին տողերն են. Դաոսականության աշխարհայացքի օրենքների ամփոփումը կարևորում է հետևյալ կետերը, ինչպիսիք են. ↑ Chan (2005), էջ. 93. ↑ Pregadio, 2008. Vol. 1, p. 327, Daoshi. ↑ 27,0 27,1 27,2 Robinet (1997), p. 63. ↑ «Human Rights Without Frontiers "Religious Freedom in China in 2006"»։ Արխիվացված օրիգինալից-ից March 27, 2009-ին (30.6 KB) An address given to the Delegation EU-China of the European Parliament. ↑ 55,0 55,1 Martinson (1987), pp. 168–169. ↑ Faching & deChant (2001), p. 35. ↑ Idema & Haft (1997), էջ. 90. ↑ e.g. Cleary, Thomas, tr. The Taoist I Ching. Shambhala, 1986. p. 6. ↑ Windows on Asia Archived 2009-02-20 at the Wayback Machine. Asian Studies Center, Michigan State University. Barrett, Rick. Taijiquan: Through the Western Gate (Blue Snake Books, 2006). 1-58394-139-8. Cane, Eulalio Paul. Harmony: Radical Taoism Gently Applied (Trafford Publishing, 2002). 1-4122-4778-0. Carr, David T. & Zhang, Canhui. Space, Time, and Culture (Springer, 2004). 1-4020-2823-7. Chan Wing-tsit. A Source Book in Chinese Philosophy (Princeton, 1963). 0-691-01964-9. Chang, Stephen T. The Great Tao (Tao Longevity LLC, 1985). 0-942196-01-5. Demerath, Nicholas J. Crossing the Gods: World Religions and Worldly Politics (Rutgers University Press, 2003). 0-8135-3207-8. Dumoulin, Heinrich, Heisig, James W. & Knitter, Paul. 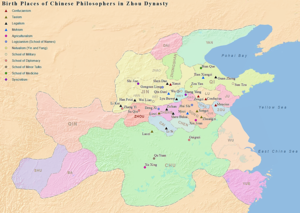 Zen Buddhism: A History (India and China) (World Wisdom, Inc., 2005). 0-941532-89-5. Fasching, Darrell J. & deChant, Dell. Comparative Religious Ethics: a narrative approach (Blackwell Publishing, 2001). 0-631-20125-4. Fisher, Mary Pat. Living Religions: An Encyclopaedia of the World's Faiths (I.B. Tauris, 1997). 1-86064-148-2. Graham, Angus. Disputers of the Tao (Open Court, 1989) 0-8126-9087-7. Hansen, Chad D. A Daoist Theory of Chinese Thought: A Philosophical Interpretation (Oxford University Press, 2000). 0-19-513419-2. Hucker, Charles O. China's Imperial Past: An Introduction to Chinese History and Culture (Stanford University Press, 1995). 0-8047-2353-2. Jones, Richard H. Mysticism and Morality: a new look at old questions (Lexington Books, 2004). 0-7391-0784-4. Keller, Catherine. The Face of the Deep: A Theology of Becoming (Routledge, 2003). 0-415-25648-8. Kim, Ha Poong. Reading Lao Tzu: A Companion to the Tao Te Ching With a New Translation (Xlibris Corporation, 2003). 1-4010-8316-1. Kirkland, Russel. Taoism: The Enduring Tradition (Routledge, 2004). 0-415-26322-0. Kohn, Livia & LaFargue, Michael, ed. Lao-Tzu and the Tao-Te-Ching (SUNY Press, 1998). 0-7914-3599-7. Kraemer, Kenneth. World Scriptures: An Introduction to Comparative Religions (Paulist Press, 1986). 0-8091-2781-4. LaFargue, Michael. Tao and Method: A Reasoned Approach to the Tao Te Ching (SUNY Press. 1994) 0-7914-1601-1. Mair, Victor H. Experimental Essays on Chuang-tzu (Hawaii, 1983) 0-88706-967-3. Markham, Ian S. & Ruparell, Tinu. Encountering Religion: an introduction to the religions of the world (Blackwell Publishing, 2001). 0-631-20674-4. Martin, William. 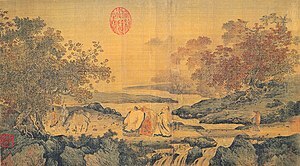 A Path And A Practice: Using Lao Tzu's Tao Te Ching as a Guide to an Awakened Spiritual Life (Marlowe & Company, 2005). 1-56924-390-5. Martinson, Paul Varo. A theology of world religions: Interpreting God, self, and world in Semitic, Indian, and Chinese thought (Augsburg Publishing House, 1987). 0-8066-2253-9. Mollier, Christine. Buddhism and Taoism Face to Face: Scripture, Ritual, and Iconographic Exchange in Medieval China. (University of Hawai'i Press, 2008). 0-8248-3169-1. Moore, Charles Alexander. The Chinese Mind: Essentials of Chinese Philosophy and Culture (University of Hawaii Press, 1967). 0-8248-0075-3. Pas, Julian F. & Leung, Man Kam. Historical Dictionary of Taoism (Scarecrow Press, 1998). 0-8108-3369-7. Prebish, Charles. Buddhism: A Modern Perspective (Penn State Press, 1975). 0-271-01195-5. Segal, Robert Alan. The Blackwell Companion to the Study of Religion (Blackwell Publishing, 2006). 0-631-23216-8. Sharot, Stephen. A Comparative Sociology of World Religions: virtuosos, priests, and popular religion (New York: NYU Press, 2001). 0-8147-9805-5. Slingerland, Edward Gilman. Effortless Action: Wu-Wei as Conceptual Metaphor and Spiritual Ideal in Early China (Oxford University Press, 2003). 0-19-513899-6. Robert E. Van Voorst Anthology of World Scriptures (Thomson Wadsworth, 2005). 0-534-52099-5. Waley, Arthur. The Way and Its Power: A Study of the Tao Te Ching and Its Place in Chinese Thought (Grove Press, 1958). 0-8021-5085-3. Watts, Alan Wilson. Tao: The Watercourse Way with Al Chung-liang Huang (Pantheon, 1977). 0-394-73311-8 .